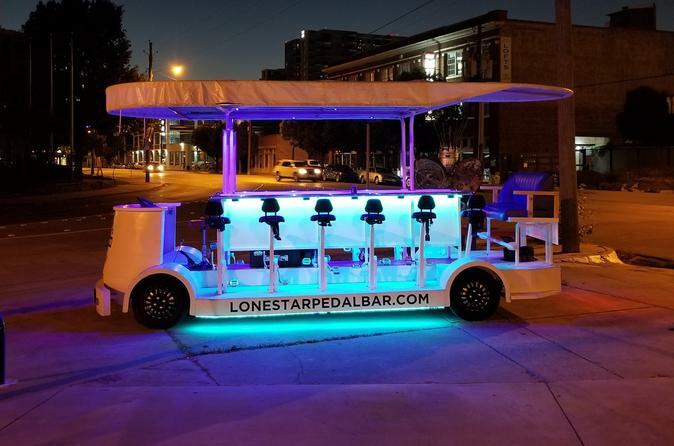 Come and ride with us for up to 15 people on a 2 hour private ride on the Dallas streets of Deep Ullum. We stop at a few bars along our route. You are able to decide where and for how long we stop. Everyone must be at least 21 years old. BYOB. Beer cans allowed or boxed wine is ok but glass containers and hard liquor is not allowed. We begin and end all of our rides at our partner location at 3400 Commerce Street in Dallas, Texas at Bowl and Tacos. Get ready to pedal while drinking and having the time of your life. All rides can fit up to 15 people and we must meet the minimum required amount of people which is 8. We have an amazing sound system and party lights to create a fun effect. Book today and lets put our pedals to the meta!